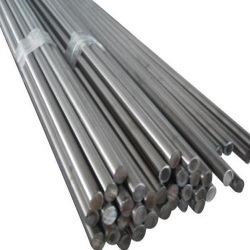 We are engaged in offering a wide range of Steel Bars to our clients. These are manufactured using high quality steel. Our offered range includes Steel Bars, MS Round Bars & TMT Bars. These are offered to our clients at reasonable rates and are appreciated due to their features like high strength & durability. 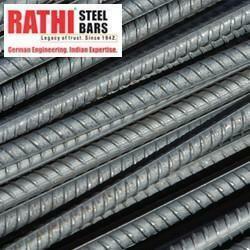 By using Rathi TMT BARS 500, you can save upto 15% of steel cost compared to any other ordinary Fe 415 rebar. This saving comes because of high strength (hence less consumption of steel), reduced wastages and reduced handling cost of Rathi 500. Due to lighter reinforcement meshes and cages, the pouring and compaction of concrete becomes easier and resulting casts of columns, beams and slabs of your house are more sound and solid, You can also get more carpet area (living space) in your house by constructing slimmer beams, colums, slabs, etc. by using Rathi 500. The savings in steel consumption can be increased if higher grade concrete is also used along with Rathi ThermoQuench 500. With assurance of quality, we are offering a wide range of Mild Steel Round Bars which are supplied from the leading vendors. At our vendors’ end, these products are manufactured with quality-approved raw material. Moreover, each offered product is tested on varied quality parameters under the supervision of our diligent professionals. Looking for Steel Bars ?